Quick and easy internet play. Easy to use league and team coaching functions. 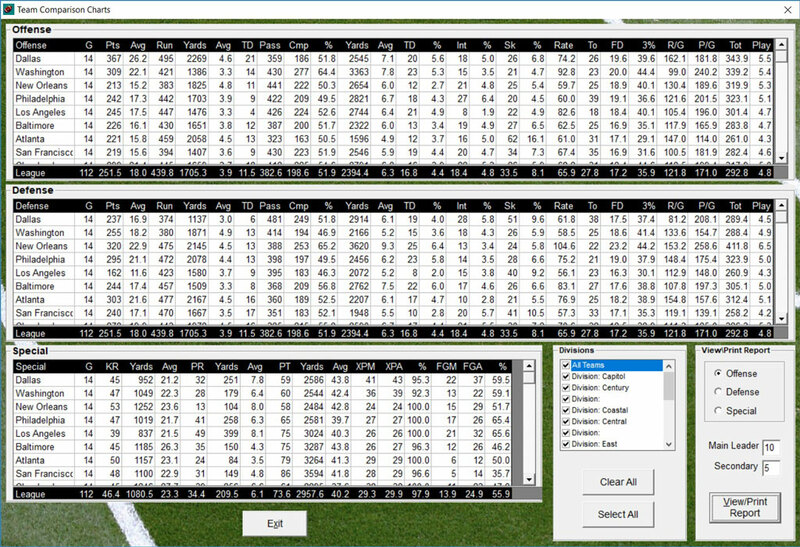 Create and modify your own leagues, teams, and players. 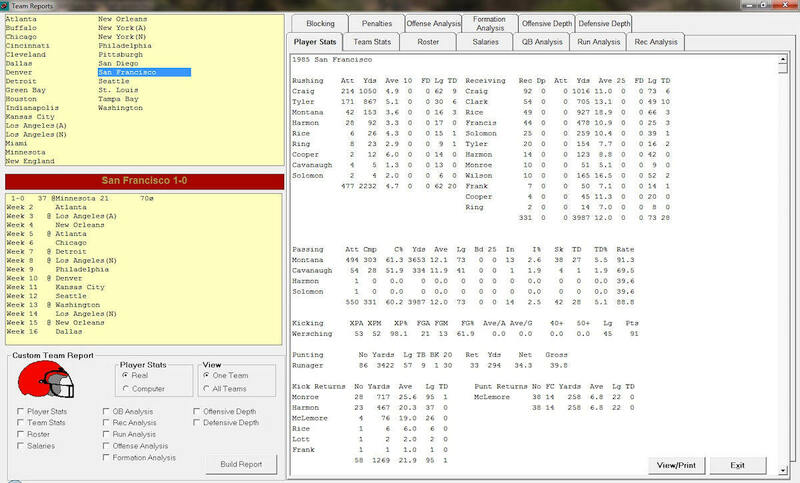 Detailed computer coaching and roster management tools. Easily make simple and complex coaching profiles. Hundreds of standard and customizable reports. Play today! Games and season disks are available for download. Action! 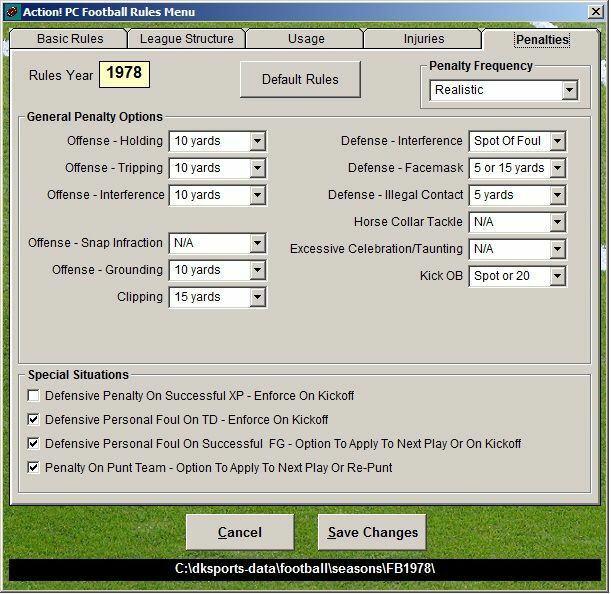 PC Football includes rules for both pro and college seasons. No need to buy two games! The redesigned Scheduled Games screen features a more attractive and user-friendly display. Each game is displayed in its own box with options for playing the game or viewing game results. 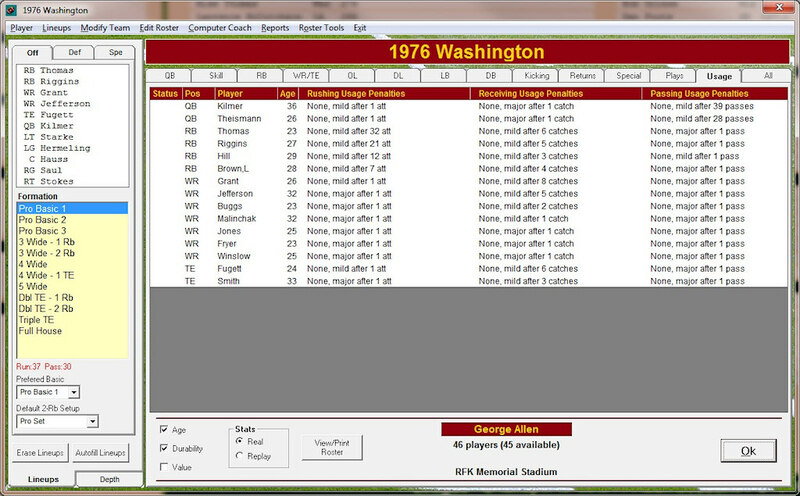 Unplayed games are displayed with team records and point spread for the game. Click the play button to start an unplayed game or the auto button to have the computer quickly play the game. 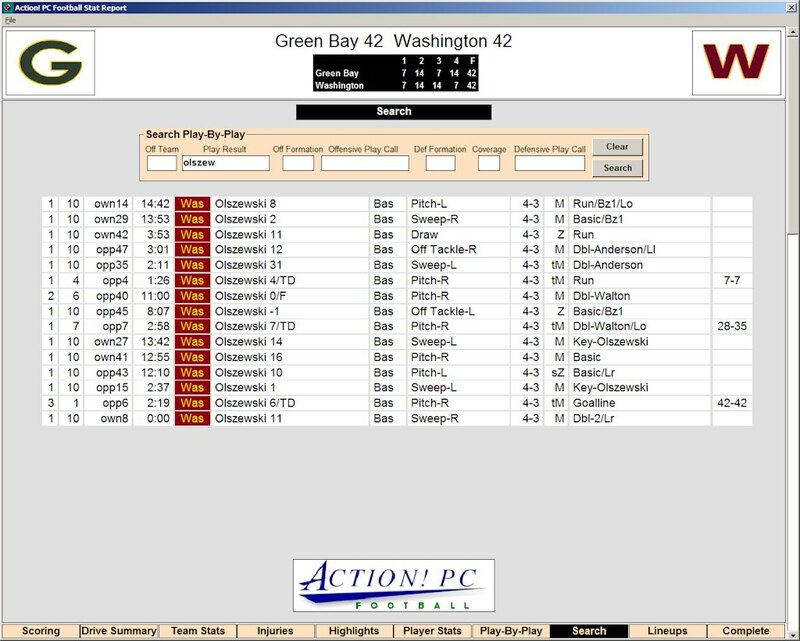 Games that have been completed are displayed with updated team records, game score, and stats for the standout player of the game. 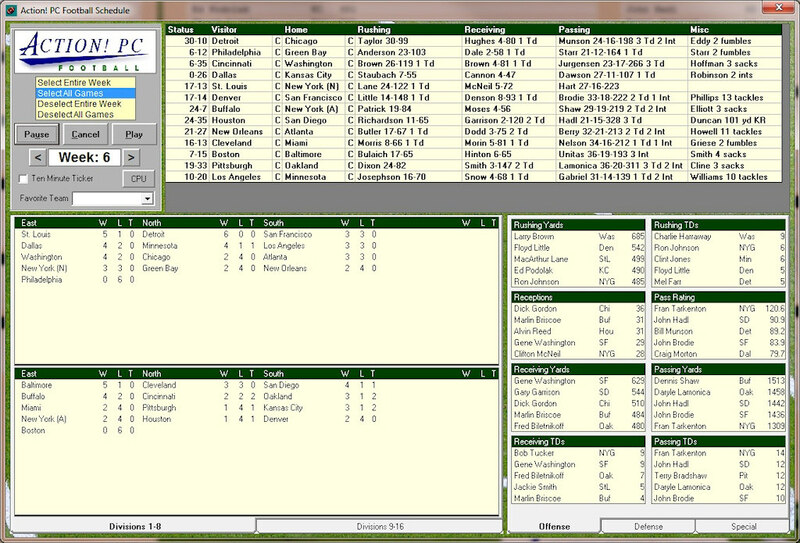 Move the mouse over the game box for a small snapshot box score or click the box button to view the full box score. 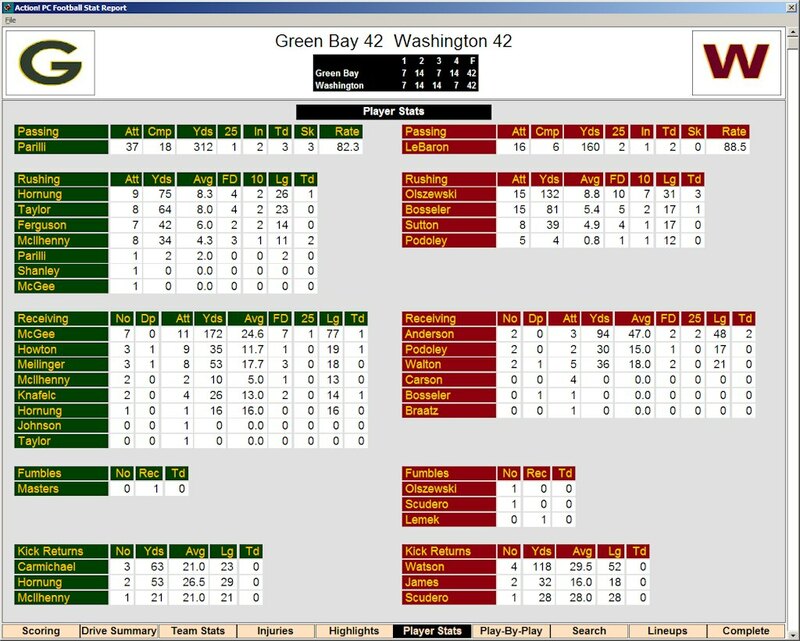 Redesigned Offensive Play Call Dashboard. More play calls have been added to the main game display and all play options are now conveniently displayed based on their usage. 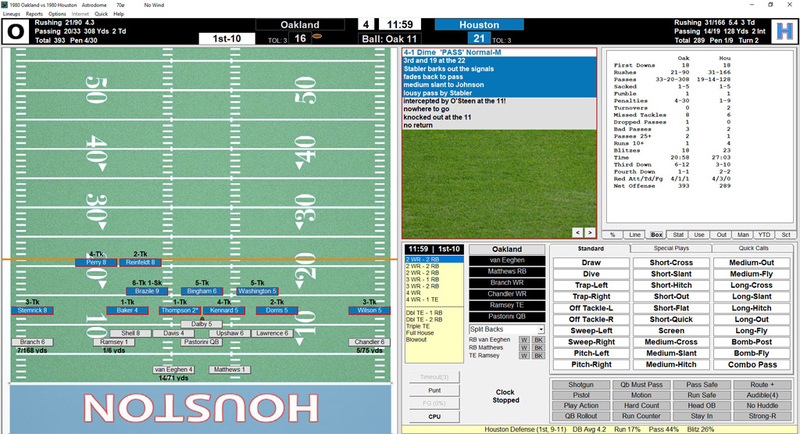 For example, options related to the formation are displayed together, clock usage options are in the same box, and buttons to move backs or receivers outside or hold in to block are adjacent to the player. Computer coach upgrades. The offensive coach is more creative calling plays and more aggressively uses audibles. The defensive coach employs better short and long yardage strategies, makes more effective double coverage choices, and more! 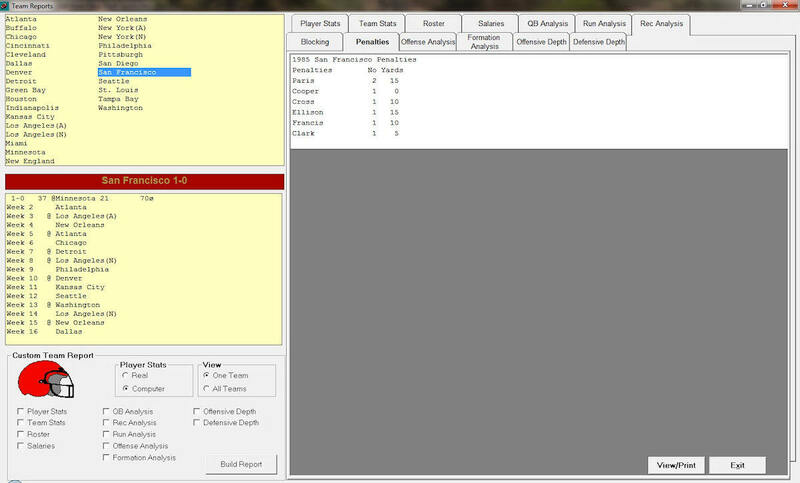 New player message box alerts let the defense know when the offense has made a significant skill position change. 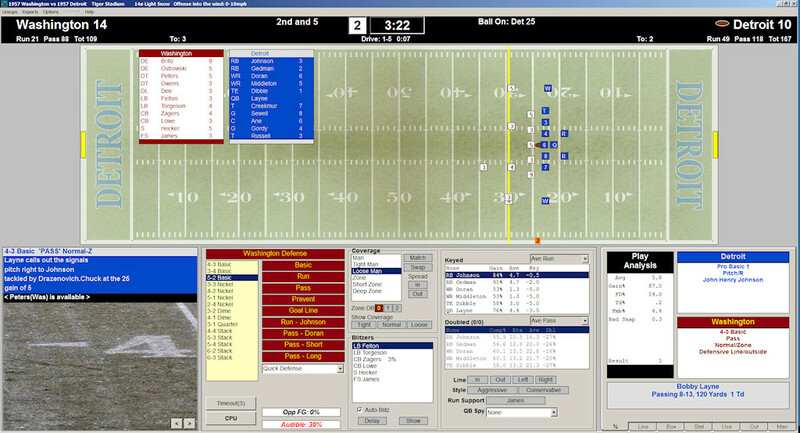 Quarterback changes and fresh receivers or ball carriers are part of the alert system. 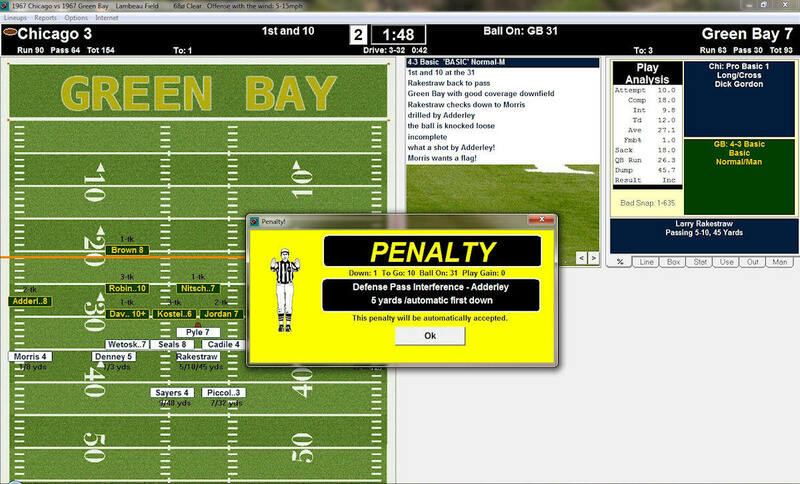 You’ll even be alerted if the offense tries to sneak in a fake punter! Updates to the video chalkboard, play-by-play, sound effects, and more. Expanded encyclopedia functionality. The list of seasons in each encyclopedia now includes the number of teams and players in each encyclopedia. Our favorite new report is the season record book included as part of the encyclopedia. 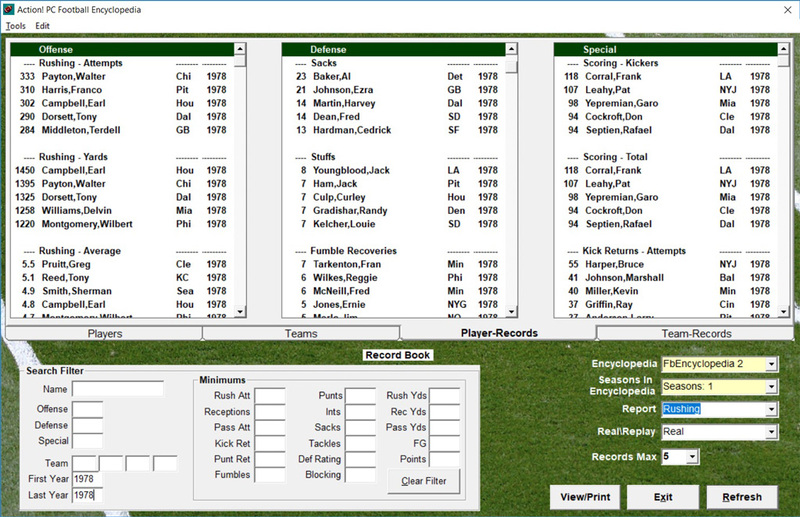 Custom record books may be created for teams or entire leagues and filtered using all available search options. 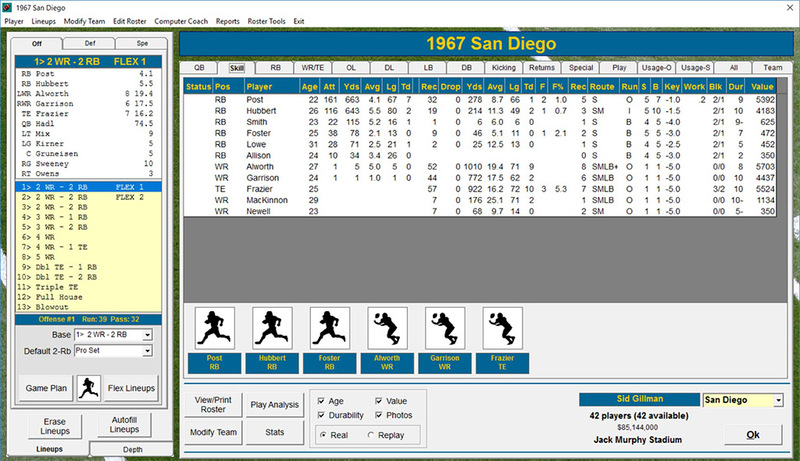 The Player form now lists real life games started and plays from scrimmage (2018 Pro Season only). Current win or loss streak is part of the Standings report. New main screen menus for easy access to import, export, and draft tools. 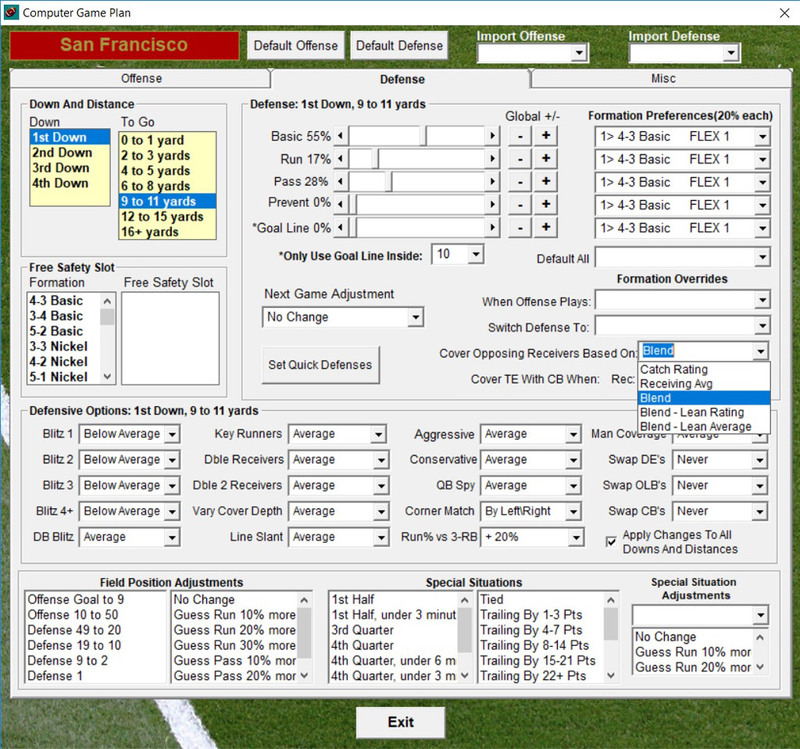 New game plan option is available to automatically switch defensive formations based on the opposing offense. If the offense switches to three receivers, your defense automatically switches to your selected nickel coverage. This option applies to both human and computer coaches. It will save you time selecting your defense, and save you from inadvertent bad defensive platoons! New player setting for player availability weeks for those who appeared on multiple teams. The 2018 player file includes pre-set weeks for players that appeared with more than one team. Speed up your online league games with new internet league rule settings for restricting usage of the chalkboard, narrator, or sound effects. Expanded playoff formats allow for up to 4 brackets of 16 teams each. 64 team football tournaments are here! Action! PC Football includes rules for pro and college seasons. No need to buy two games! Save $5.00 If you own any previous edition of Action! PC Football, use the word UPGRADE as your discount code when ordering the Deluxe or Deluxe-Classic package. The special upgrade offer is only available with online purchases of the Deluxe or Deluxe-Classic packages. If you are new to Dave Koch Sports or haven’t tried our game in a while, here is the package for you! Past Seasons: 2017, 2016, 2015, 2014, 2000, 1988, 1975, 1958, and 1949. Free Action! PC Football Strategy Guide in PDF form. Action! 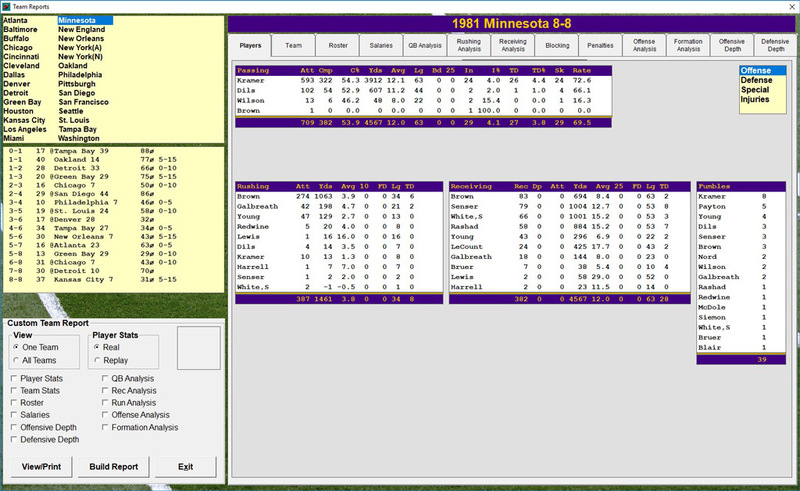 PC Football is the most comprehensive stat-based football game on the market. Action! PC Football is designed to challenge your mind and not your fingers. Play results are determined by lineups, play calls and strategy rather than joystick skill and dice rolls. You’re the coach with hundreds of strategy options available! In Action! 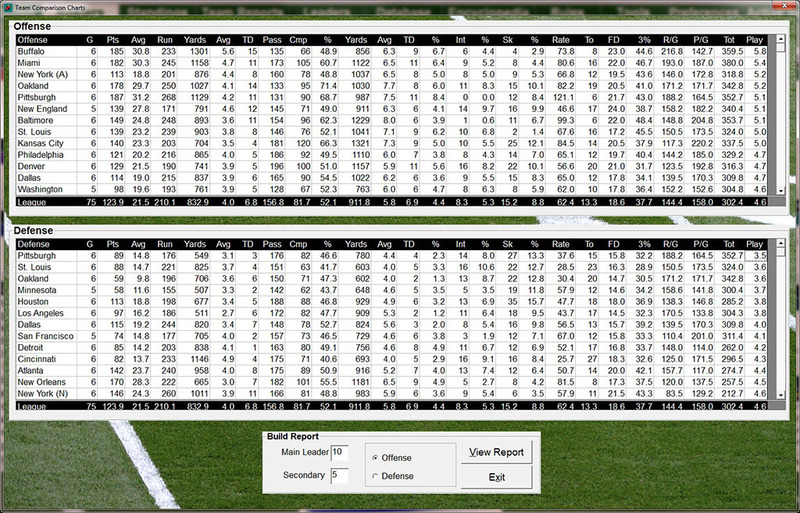 PC Football, players are rated using every available published statistic as well as expert subjective analysis. 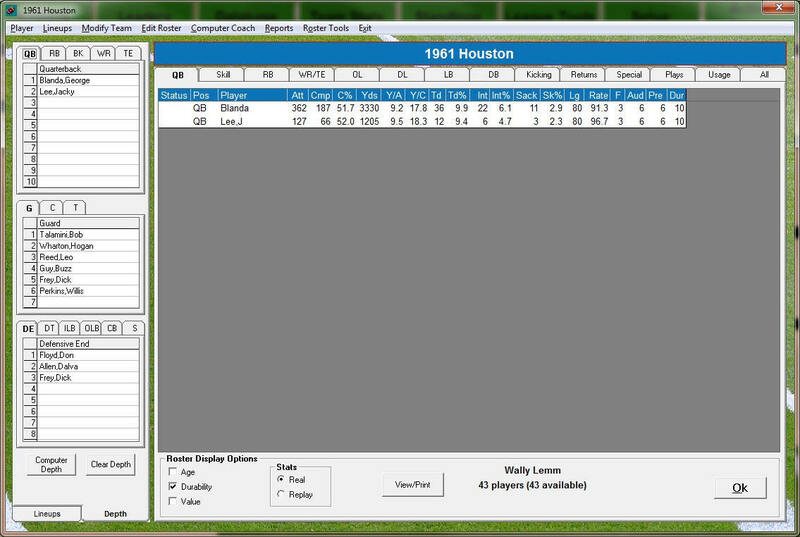 Each player performs as he did in real life with amazing statistical accuracy. Action! 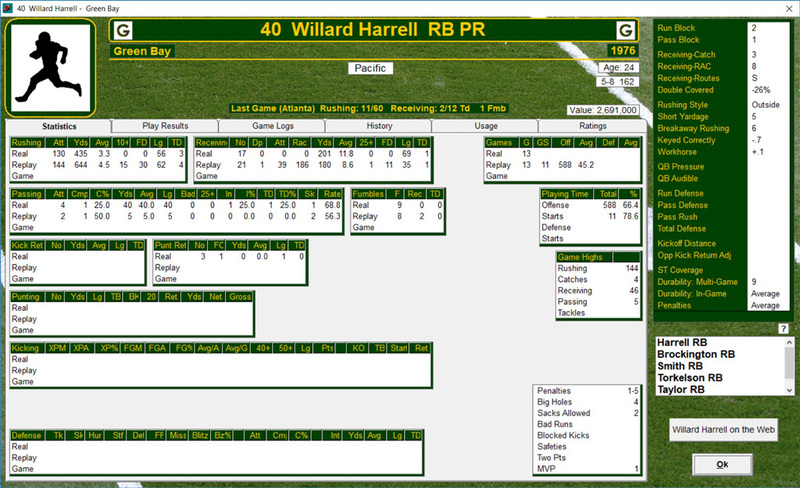 PC Football also includes extensive player, team, and league statistical reports. Play games head-to-head, over the internet, or against the computer. 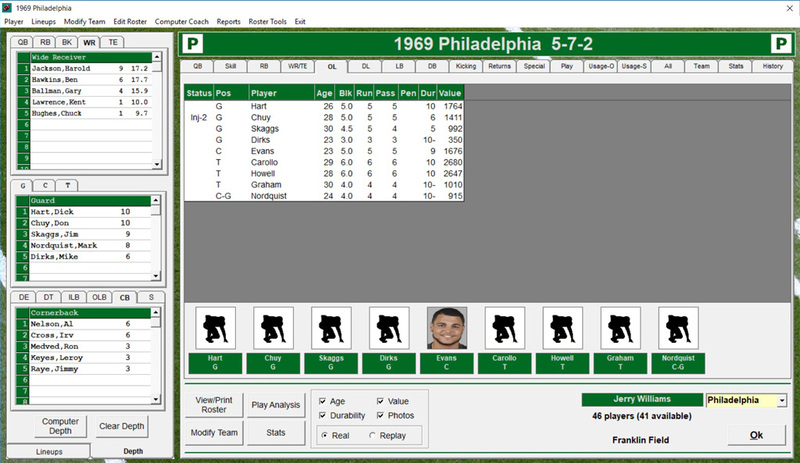 Relive past seasons as the coach of your favorite team; draft teams and play games in a league; let the computer manage all of the teams and watch the results; or set your coaching preferences for a specific team and let the computer play a season with your coaching profile. Any way you play, you’ll love the statistical accuracy and strategy Action! PC Football brings to your home computer. Action! 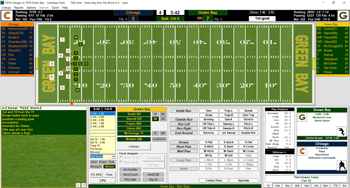 PC Football is a detailed, comprehensive, and challenging football simulation game, yet is so simple to play you may never need to refer to the manual. 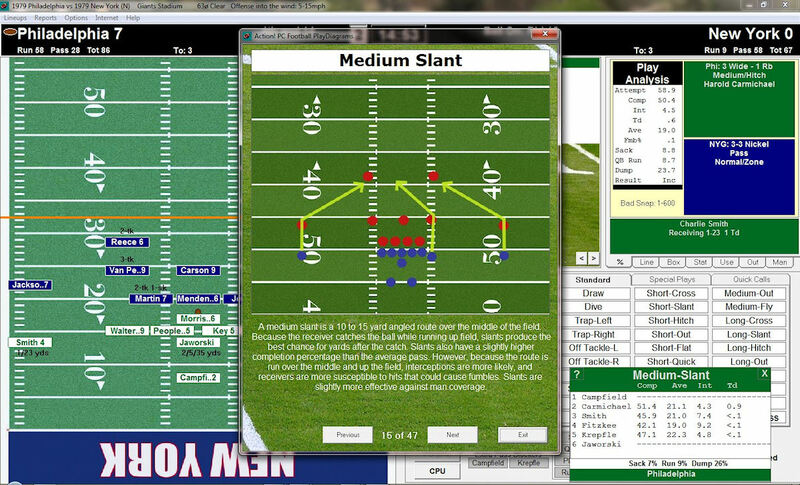 To call a play, the offensive coach simply clicks on the name of the play such as "sweep left" or “short slant”, and then clicks the ball carrier or primary receiver. 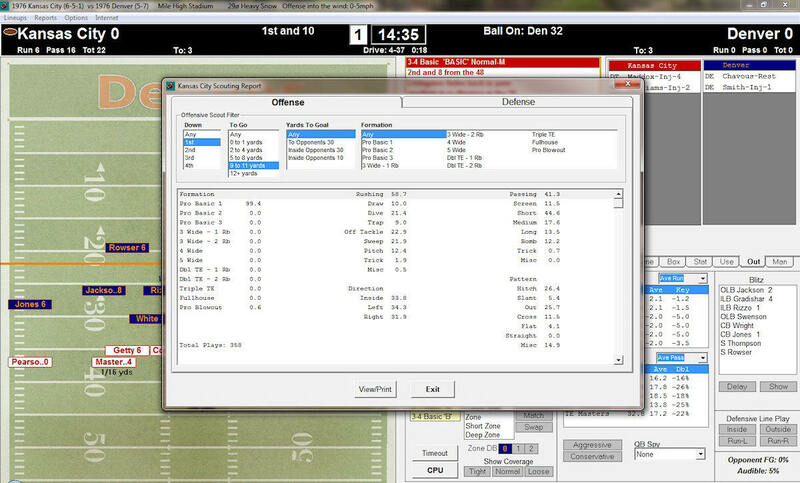 Plays may also be called by first clicking on the ball carrier or intended receiver, and then choosing from a list of available plays for that player. 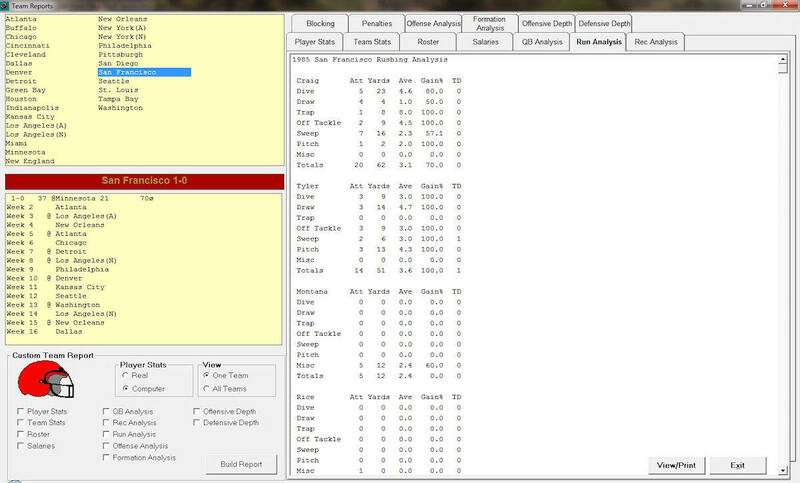 In addition to having manu basic plays to choose from, the offensive coach also has the option of toggling between one of 13 pre-saved platoons (3 tight ends, 5 wide receivers, full house backfield or any combination possible). The offense also has a list of options that can further enhance the play. These options include shotgun, roll-out, play action, run counter, head out of bounds, and many others. You can even read the defense and call audibles at the line of scrimmage! 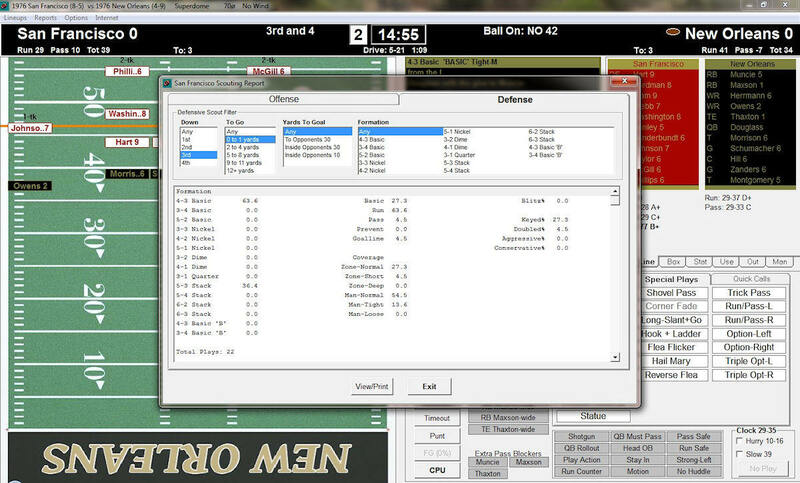 Defensive play calling is flexible and customizable. 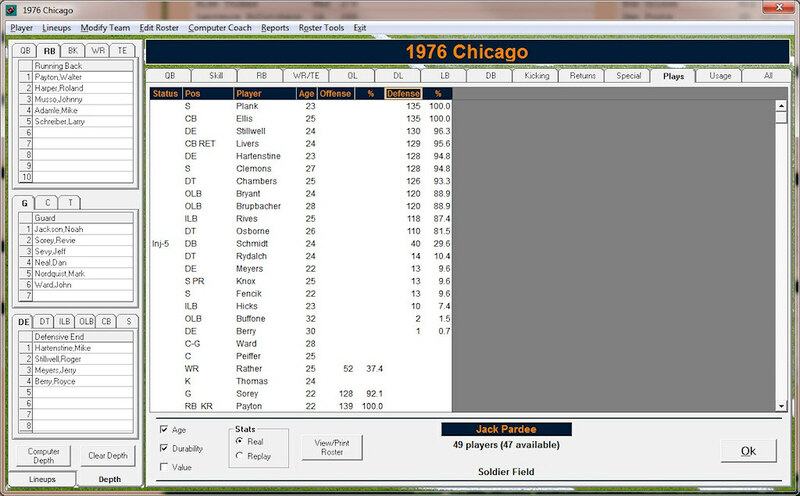 The defensive coach selects one of 16 platoons (4-3, 3-4, nickel, dime, etc. ), and calls a defensive play (basic, run defense, pass defense, prevent, or goal line defense). On any play, a coach can also set pass coverage style and depth, aggressiveness, defensive line play, run keys, double coverages, blitzers and many other options. 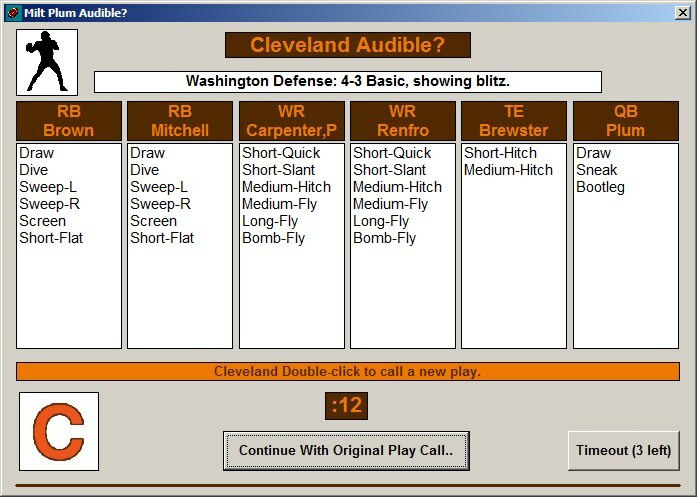 The defense can even use deception tactics such as showing or disguising a blitz in order to protect against audibles, or to lure the offense into bad audibles. 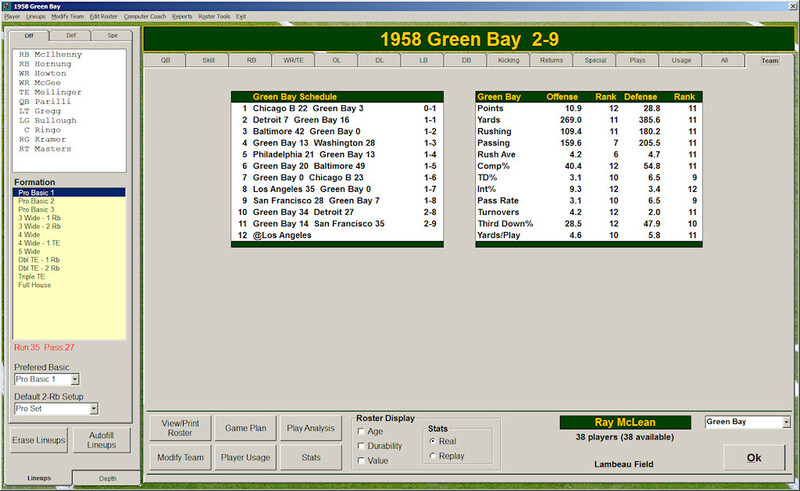 Once both offensive and defensive plays have been called, the computer generates both a play result and a radio style play-by-play description. Every factor that affects real life results is built into the game formulas. On any given play, these include player ratings and statistics, strategies and play calls, field position, wind and weather, home field advantage, and player fatigue; just to name a few! Penalties, injuries, and replay challenges all occur with realistic frequency. On special teams, choose kick off deep, kick away from the primary kick returner, squib kick, or onside kick. On punts, choose to punt deep, angle the punt, pooch punt, or fake. The return team may try to block the punt, return the punt, call for a fair catch, let the punt roll, or guard against fakes. With our video chalkboard, you have the option of watching your play results with ball movement as well as complete offensive and defensive player movement! Action! PC sports games have long been the leaders in internet play. In a few simple steps, you can connect for a single game or an entire series against any other Action! PC Football game owner—no third party software is needed! 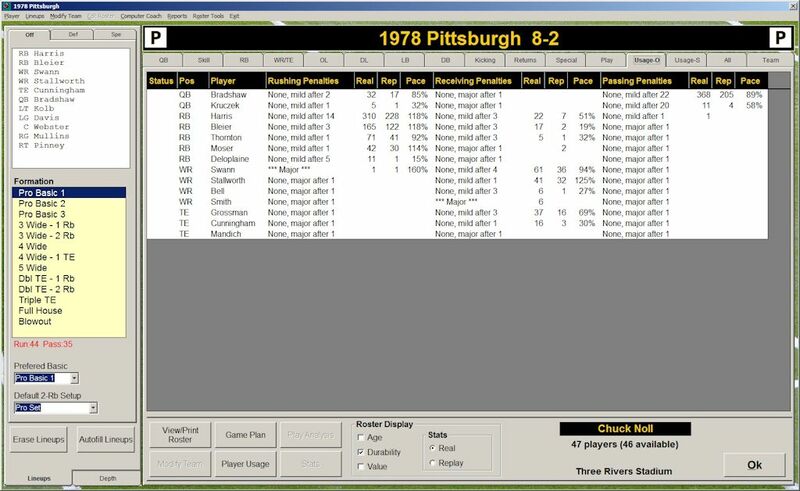 Players connect using their IP address. The game plays quickly—just like playing in the same room. 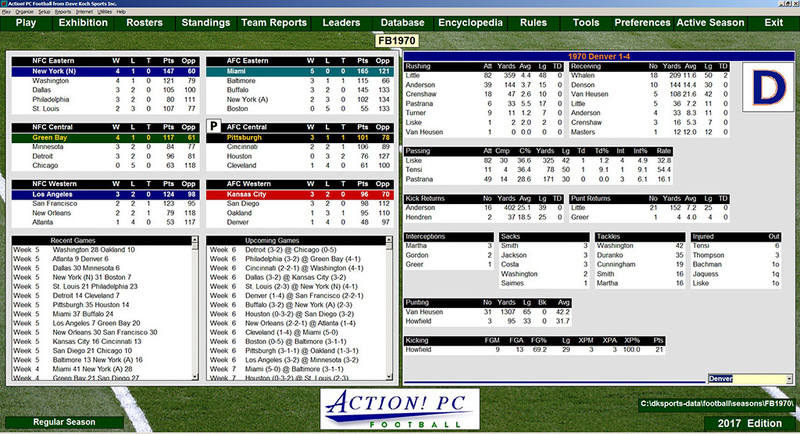 After a game, click one button to send the game headline and box score to every member of your league. 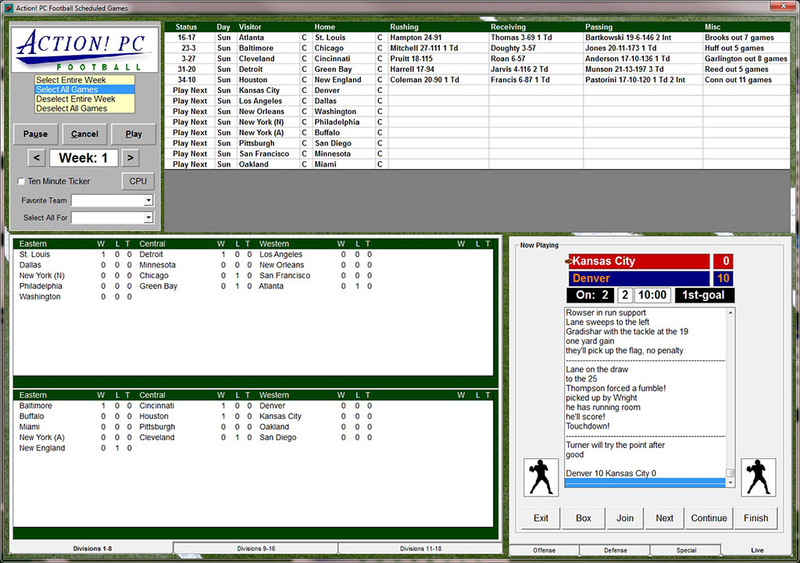 Click another button to send the game’s data file to the league statistician. 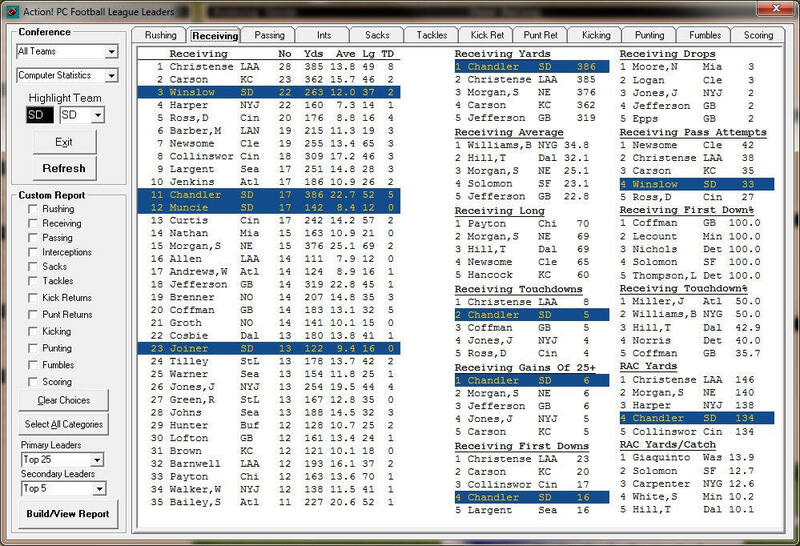 You can even create a league address book and league website with just a few mouse clicks! At the heart of the Action! 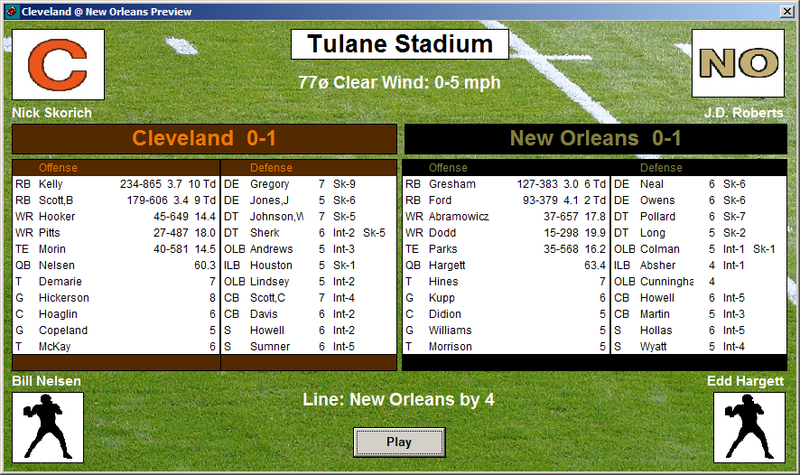 PC Football game engine is a very powerful stats compiler. 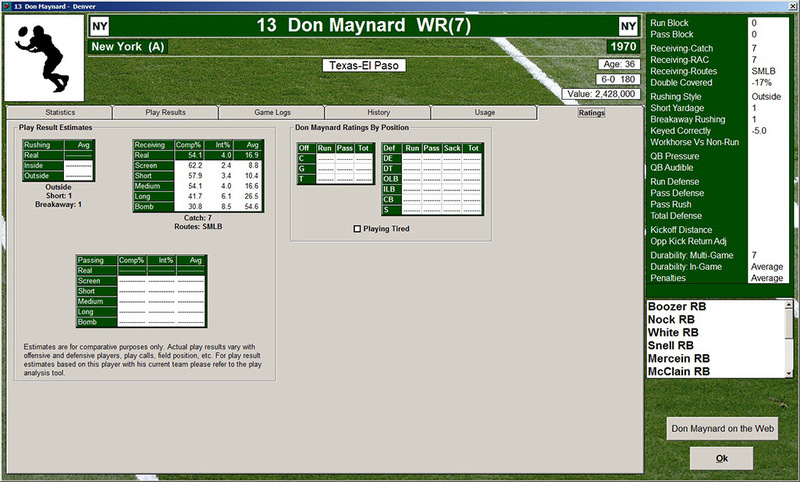 We offer all the well known published stats as well as a host of unique statistical categories such as receiver rac, drops, bad passes, player rushing and receiving, first downs, stuffs, hurries, deflections and many more. 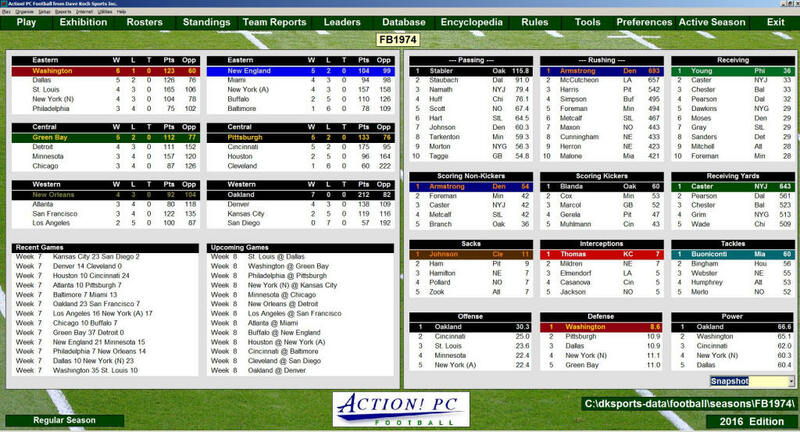 We offer a host reports covering boxscores, play by play, big games, salary cap, injuries, team comparison, league leaders, records, team tendencies, encyclopedia, team analysis reports and much more. Action! 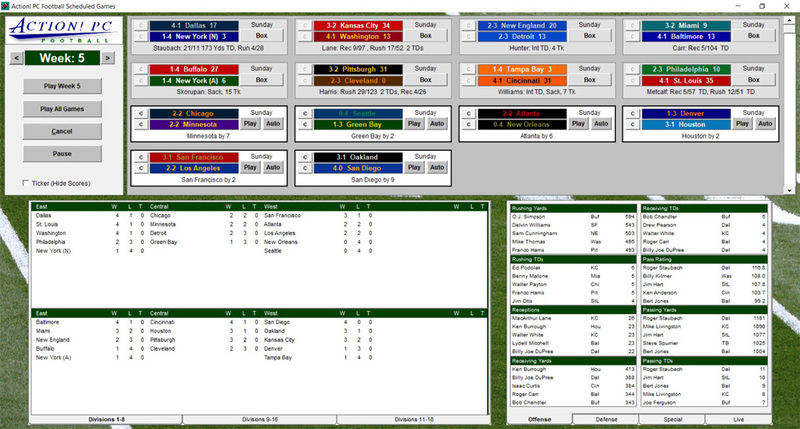 PC Football offers the most complete package of league and team management functions in the sports simulation hobby! Teams: Teams may be created, modified, moved or imported as desired with a maximum roster size of 70 players! 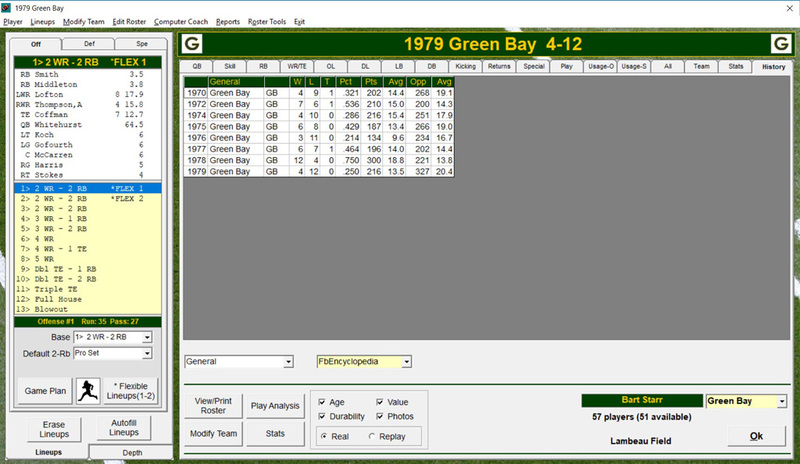 You can even edit team colors, logos, field designs, and player photos. Players: Players may be created, edited, released, erased, drafted or traded. You can even draft against the computer! Schedules: Use the default schedule or create and modify your own schedule. Instant Replay Challenges: With the instant replay challenge option, you are offered opportunities to have a play reviewed. These opportunities occur with real-life frequency. 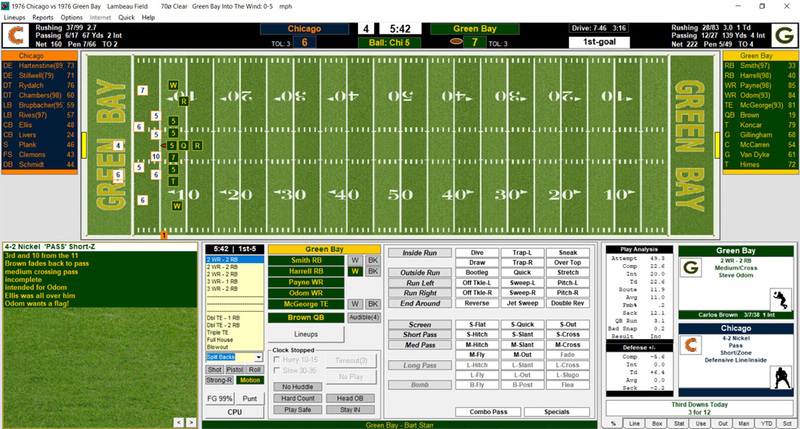 You decide if you'd like to challenge the ruling on the field based on the game situation and the overrule success percentage displayed on the screen. Many challenge situations are included: fumbles, down-by-contact rulings, spot of the ball on first downs and touchdowns, and many more. Rushing: Based on attempts, yards, average, long runs, touchdowns, fumble frequency, breakaway ability, short yardage ability, rushing style and durability. Receiving: Based on catches, drops, yards, average, long catches, touchdowns, fumble frequency, run after catch, and durability. Passing: Based on completions, interceptions, touchdowns, pass rating, yardage, times sacked, scrambling, bad passes, durability, ability under pressure and audible ability. 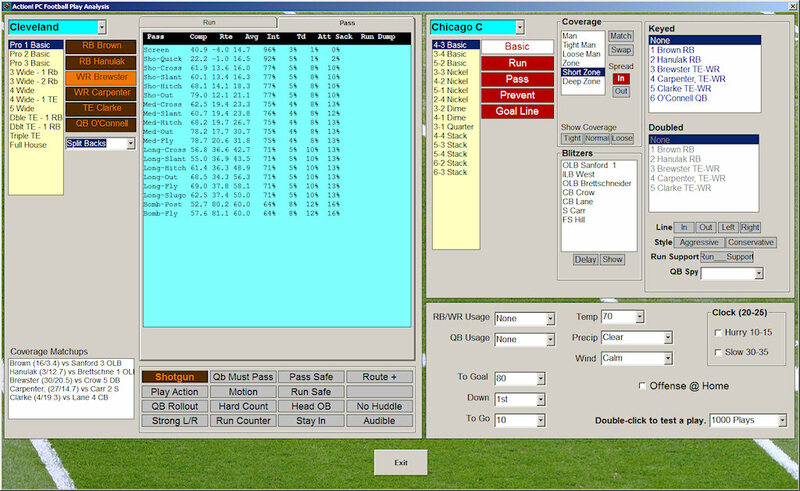 Blocking: Run and pass block ratings are given to each player. Defense: Defensive players are rated for pass rush, run defense, and pass defense, as well as tackles, forced fumbles, interceptions, stuffs, deflections, hurries and durability. The staff at Dave Koch Sports is continually adding to its lineup of past season disks, for all of the Action! PC sports games. These disks are based on the complete official statistics as released by the leagues. Every season since 1920 is available!